Die Martis, 13° Septembris 1831. Sir R. W. Vaughan v. Lady C. S. Hamilton et al. Napier v. Goldie et al. Glendonwyn & Kennedy v. Goldie et al. Ker & Johnston v. Bell et al. Game Bill, Petition of T. Goodlake against. Poor Laws, Petitions from Corsham & Chippenham for Introduction of, into Ireland. 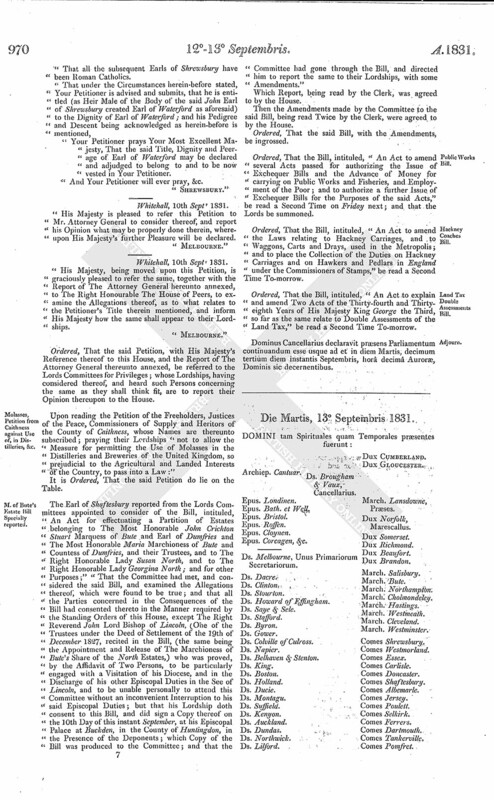 Reform of Parliament, Petition of Renfrewshire Political Union in favor of. Beer Act Amendment Bill, Petition of Clergy of Deaneries of Elham & Lympne respecting. Beer Act, Petition from Speen for Repeal of. Petition of the Commons of Lower Canada for Redress of Grievances. Governors, &c. of Catholic Orphan Societies, Dublin. Yeomanry Corps, (Ireland,) Petition from Newtownbarry, &c. for disbanding; and for Inquiry into the late Affair at Newtownbarry. 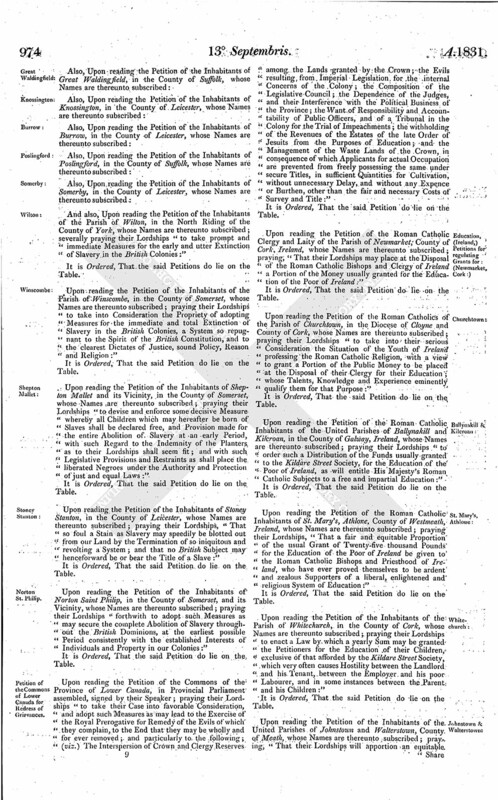 Poor Laws, Petition from Whitechurch for Introduction of, into Ireland. Reform of Parliament, Petition from Maglass, &c. in favor of. Vote by Ballot, Petition from Navan in favor of. Burial Act, (Ireland,) Petition from Ratoath for Repeal of. 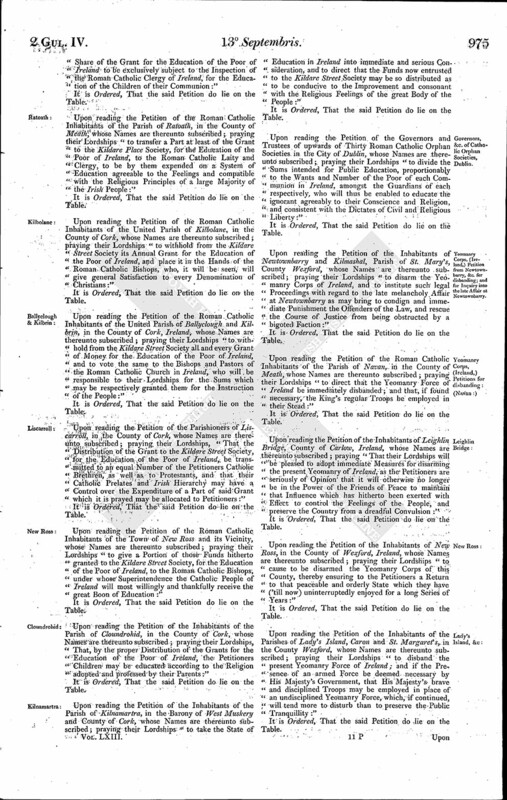 Marriages between Protestants & Catholics by Catholic Clergymen, Petitions from Navan respecting. Church Lands, (Ireland,) Petition from Navan respecting. Land Tax Double Assessments Bill. Hunter v. Gardner, Respondent's Agent's Petition to lodge Case, referred to Appeal Comee. Sir R. W. Vaughan v. Lady C. S. Hamilton et al. Respondents Petition to lodge their Case, referred to Appeal Comee. The Answer of The Right Honorable Lady Charlotte Sophia Baillie Hamilton, Widow of The Reverend Archdeacon Charles Baillie Hamilton of Rumbletonlaw; George Baillie Hamilton Esquire, now of Rumbletonlaw; The Right Honorable Alexander Earl of Home; The Right Honorable Thomas Earl of Haddington; George Baillie Esquire, of Jerviswood; and John Tod, Writer to the Signet, Trustees and Executors of the said Reverend Charles Baillie Hamilton; and Sir William Scott of Ancrum, Baronet, Executor Dative qua Creditor decerned and confirmed to the late Sir John Scott of Ancrum, Baronet, his Father; and Warren Hastings Sands Esquire, Writer to the Signet, Trustee of the late Sir Henry Hay Makdougall of Mackerstoun, Baronet, to the Petition and Appeal of Sir Robert Williams Vaughan Baronet, was this Day brought in. Ordered and Adjudged, by the Lords Spiritual and Temporal in Parliament assembled, That the said Original and Cross Appeals be, and the same are hereby dismissed this House, and that the said several Interlocutors therein complained of, be, and the same are hereby Affirmed. Robert Earl Grosvenor, being, by Letters Patent bearing Date the 13th Day of September, in the Second Year of the Reign of His present Majesty, created Marquess of Westminster, with Remainder to the Heirs Male of his Body, was (in his Robes) introduced between The Marquess of Lansdowne and The Marquess of Cholmondeley, (also in their Robes,) the Yeoman Usher of the Black Rod, Garter King of Arms and The Earl Marshal preceding: His Lordship, on his Knee, presented his Patent to The Lord Chancellor at the Woolsack, who delivered it to the Clerk, and the same was read at the Table. 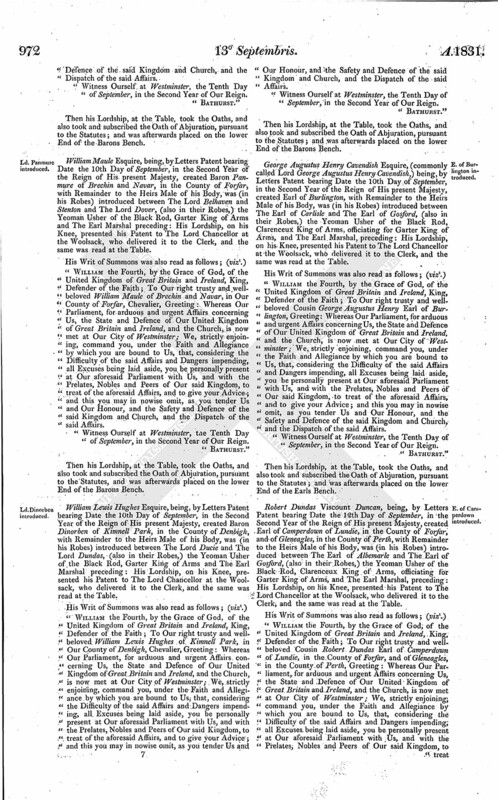 "William the Fourth, by the Grace of God, of the United Kingdom of Great Britain and Ireland, King, Defender of the Faith; To Our right trusty and entirelybeloved Cousin and Councillor Robert Marquess of Westminster, Greeting: Whereas Our Parliament, for arduous and urgent Affairs concerning Us, the State and Defence of Our United Kingdom of Great Britain and Ireland, and the Church, is now met at Our City of Westminster; We, strictly enjoining, command you, under the Faith and Allegiance by which you are bound to Us, that, considering the Difficulty of the said Affairs and Dangers impending, all Excuses being laid aside, you be personally present at Our aforesaid Parliament with Us, and with the Prelates, Nobles and Peers of Our said Kingdom, to treat of the aforesaid Affairs, and to give your Advice; and this you may in nowise omit, as you tender Us and Our Honour, and the Safety and Defence of the said Kingdom and Church, and the Dispatch of the said Affairs. "Witness Ourself at Westminster, the Thirteenth Day of September, in the Second Year of Our Reign. Then his Lordship, at the Table, took the Oaths, and also took and subscribed the Oath of Abjuration, pursuant to the Statutes; and was afterwards placed on the upper End of the Earls Bench. Sir George Warwick Bampfylde Baronet, being, by Leters Patent bearing Date the 10th Day of September, in the Second Year of the Reign of His present Majesty, created Baron Poltimore of Poltimore, in the County of Devon, with Remainder to the Heirs Male of his Body, was (in his Robes) introduced between The Lord Ducie and The Lord Segrave, (also in their Robes,) the Yeoman Usher of the Black Rod, Garter King of Arms and The Earl Marshal preceding: His Lordship, on his Knee, presented his Patent to The Lord Chancellor at the Woolsack, who delivered it to the Clerk, and the same was read at the Table. "William the Fourth, by the Grace of God, of the United Kingdom of Great Britain and Ireland, King, Defender of the Faith; To Our right trusty and wellbeloved George Warwick Bampfylde of Pollimore, in Our County of Devon, Chevalier, Greeting: Whereas Our Parliament, for arduous and urgent Affairs concerning Us, the State and Defence of Our United Kingdom of Great Britain and Ireland, and the Church, is now met at Our City of Westminster; We, strictly enjoining, command you, under the Faith and Allegiance by which you are bound to Us, that, considering the Difficulty of the said Affairs and Dangers impending, all Excuses being laid aside, you be personally present at Our aforesaid Parliament with Us, and with the Prelates, Nobles and Peers of Our said Kingdom, to treat of the aforesaid Affairs, and to give your Advice; and this you may in nowise omit, as you tender Us and Our Honour, and the Safety and Defence of the said Kingdom and Church, and the Dispatch of the said Affairs. "Witness Ourself at Westminster, the Tenth Day of September, in the Second Year of Our Reign. Then his Lordship, at the Table, took the Oaths, and also took and subscribed the Oath of Abjuration, pursuant to the Statutes; and was afterwards placed on the lower End of the Barons Bench. William Maule Esquire, being, by Letters Patent bearing Date the 10th Day of September, in the Second Year of the Reign of His present Majesty, created Baron Panmure of Brechin and Navar, in the County of Forfar, with Remainder to the Heirs Male of his Body, was (in his Robes) introduced between The Lord Belhaven and Stenton and The Lord Dover, (also in their Robes,) the Yeoman Usher of the Black Rod, Garter King of Arms and The Earl Marshal preceding: His Lordship, on his Knee, presented his Patent to The Lord Chancellor at the Woolsack, who delivered it to the Clerk, and the same was read at the Table. "William the Fourth, by the Grace of God, of the United Kingdom of Great Britain and Ireland, King, Defender of the Faith; To Our right trusty and wellbeloved William Maule of Brechin and Navar, in Our County of Forfar, Chevalier, Greeting: Whereas Our Parliament, for arduous and urgent Affairs concerning Us, the State and Defence of Our United Kingdom of Great Britain and Ireland, and the Church, is now met at Our City of Westminster; We, strictly enjoining, command you, under the Faith and Allegiance by which you are bound to Us, that, considering the Difficulty of the said Affairs and Dangers impending, all Excuses being laid aside, you be personally present at Our aforesaid Parliament with Us, and with the Prelates, Nobles and Peers of Our said Kingdom, to treat of the aforesaid Affairs, and to give your Advice; and this you may in nowise omit, as you tender Us and Our Honour, and the Safety and Defence of the said Kingdom and Church, and the Dispatch of the said Affairs. Then his Lordship, at the Table, took the Oaths, and also took and subscribed the Oath of Abjuration, pursuant to the Statutes, and was afterwards placed on the lower End of the Barons Bench. William Lewis Hughes Esquire, being, by Letters Patent bearing Date the 10th Day of September, in the Second Year of the Reign of His present Majesty, created Baron Dinorben of Kimnell Park, in the County of Denbigh, with Remainder to the Heirs Male of his Body, was (in his Robes) introduced between The Lord Ducie and The Lord Dundas, (also in their Robes,) the Yeoman Usher of the Black Rod, Garter King of Arms and The Earl Marshal preceding: His Lordship, on his Knee, presented his Patent to The Lord Chancellor at the Woolsack, who delivered it to the Clerk, and the same was read at the Table. "William the Fourth, by the Grace of God, of the United Kingdom of Great Britain and Ireland, King, Defender of the Faith; To Our right trusty and wellbeloved William Lewis Hughes of Kimnell Park, in Our County of Denbigh, Chevalier, Greeting: Whereas Our Parliament, for arduous and urgent Affairs concerning Us, the State and Defence of Our United Kingdom of Great Britain and Ireland, and the Church, is now met at Our City of Westminster; We, strictly enjoining, command you, under the Faith and Allegiance by which you are bound to Us, that, considering the Difficulty of the said Affairs and Dangers impending, all Excuses being laid aside, you be personally present at Our aforesaid Parliament with Us, and with the Prelates, Nobles and Peers of Our said Kingdom, to treat of the aforesaid Affairs, and to give your Advice; and this you may in nowise omit, as you tender Us and Our Honour, and the Safety and Defence of the said Kingdom and Church, and the Dispatch of the said Affairs. George Augustus Henry Cavendish Esquire, (commonly called Lord George Augustus Henry Cavendish,) being, by Letters Patent bearing Date the 10th Day of September, in the Second Year of the Reign of His present Majesty, created Earl of Burlington, with Remainder to the Heirs Male of his Body, was (in his Robes) introduced between The Earl of Carlisle and The Earl of Gosford, (also in their Robes,) the Yeoman Usher of the Black Rod, Clarenceux King of Arms, officiating for Garter King of Arms, and The Earl Marshal, preceding: His Lordship, on his Knee, presented his Patent to The Lord Chancellor at the Woolsack, who delivered it to the Clerk, and the same was read at the Table. "William the Fourth, by the Grace of God, of the United Kingdom of Great Britain and Ireland, King, Defender of the Faith; To Our right trusty and wellbeloved Cousin George Augustus Henry Earl of Burlington, Greeting: Whereas Our Parliament, for arduous and urgent Affairs concerning Us, the State and Defence of Our United Kingdom of Great Britain and Ireland, and the Church, is now met at Our City of Westminster; We, strictly enjoining, command you, under the Faith and Allegiance by which you are bound to Us, that, considering the Difficulty of the said Affairs and Dangers impending, all Excuses being laid aside, you be personally present at Our aforesaid Parliament with Us, and with the Prelates, Nobles and Peers of Our said Kingdom, to treat of the aforesaid Affairs, and to give your Advice; and this you may in nowise omit, as you tender Us and Our Honour, and the Safety and Defence of the said Kingdom and Church, and the Dispatch of the said Affairs. Then his Lordship, at the Table, took the Oaths, and also took and subscribed the Oath of Abjuration, pursuant to the Statutes; and was afterwards placed on the lower End of the Earls Bench. Robert Dundas Viscount Duncan, being, by Letters Patent bearing Date the 12th Day of September, in the Second Year of the Reign of His present Majesty, created Earl of Camperdown of Lundie, in the County of Forfar, and of Gleneagles, in the County of Perth, with Remainder to the Heirs Male of his Body, was (in his Robes) introduced between The Earl of Albemarle and The Earl of Gosford, (also in their Robes,) the Yeoman Usher of the Black Rod, Clarenceux King of Arms, officiating for Garter King of Arms, and The Earl Marshal, preceding: His Lordship, on his Knee, presented his Patent to The Lord Chancellor at the Woolsack, who delivered it to the Clerk, and the same was read at the Table. "William the Fourth, by the Grace of God, of the United Kingdom of Great Britain and Ireland, King, Defender of the Faith; To Our right trusty and wellbeloved Cousin Robert Dundas Earl of Camperdown of Lundie, in the County of Forfar, and of Gleneagles, in the County of Perth, Greeting: Whereas Our Parliament, for arduous and urgent Affairs concerning Us, the State and Defence of Our United Kingdom of Great Britain and Ireland, and the Church, is now met at Our City of Westminster; We, strictly enjoining, command you, under the Faith and Allegiance by which you are bound to Us, that, considering the Difficulty of the said Affairs and Dangers impending; all Excuses being laid aside, you be personally present at Our aforesaid Parliament with Us, and with the Prelates, Nobles and Peers of Our said Kingdom, to treat of the aforesaid Affairs, and to give your Advice; and this you may in nowise omit, as you tender Us and Our Honour, and the Safety and Defence of the said Kingdom and Church, and the Dispatch of the said Affairs. "Witness Ourself at Westminster, the Twelfth Day of September, in the Second Year of Our Reign. Ordered, That the Hearing of the Cause wherein Mrs. Ismene Magdalina Glendonwyn or Scott and Robert Kennedy are Appellants, and Alexander Goldie, and others, are Respondents, which stands appointed for this Day, be put off 'till To-morrow. Ordered, That the Cause wherein James Ker and Henry Johnston Esquires are Appellants, and John Bell, and others, are Respondents, be heard by Counsel at the Bar To-morrow. Upon reading the Petition of Thomas Goodlake Esquire, taking notice of a Bill depending in this House, intituled, "An Act to amend the Laws in England relative to Game;" and praying their Lordships "to reject it, and introduce another Bill, so as to amend the present Qualifications of Sportsmen, and allow the Sale of Game without Enactments tending to make Game private Property before it is killed:"
Upon reading the Petition of the Inhabitants of the Town and Neighbourhood of Corsham, in the County of Wilts, whose Names are thereunto subscribed; praying their Lordships "to take into Consideration the Propriety of introducing some System of Poor Laws into Ireland, accompanied with a Tax on Absentees:"
Upon reading the Petition of the Inhabitants of the Borough of Chippenham and its Vicinity, in the County of Wilts, whose Names are thereunto subscribed; praying their Lordships "speedily to take into Consideration the Propriety of establishing a Poor Law in Ireland similar to that which has existed for Two Centuries in Great Britain, and thus to place the Inhabitants of the Three Kingdoms on an equal Footing in those most important Points, the Laws which determine the Condition of the Labouring Class and the Cost of raising Agricultural Produce:"
A Petition of Sir John Maxwell Baronet, of Pollok, Chairman, and the other Members of the Renfrewshire Political Union, was presented and read; praying their Lordships, "That the Measure for amending the Representation of the People, now before Parliament, may pass into a Law:"
Ordered, That the said Petition be received as the Petition of Sir John Maxwell, Chairman, and George Gardner, Secretary of the said Political Union, who only have signed it. The Earl of Shaftesbury (in the Absence of the Lords with White Staves) reported, "That they had (according to Order) waited on His Majesty with their Lordships Address of the 1st Day of this instant September; and that His Majesty was pleased to receive the same very graciously, and to say, He would give Directions accordingly." 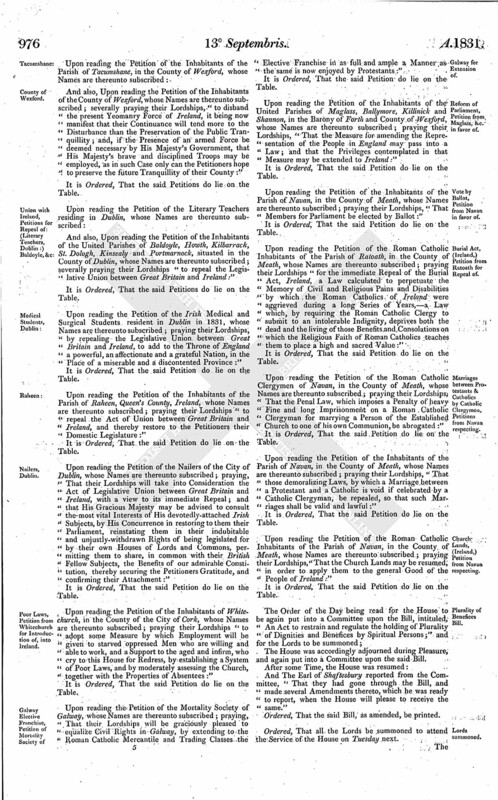 Upon reading the Petition of the Clergy of that Part of the Diocese of Canterbury comprehended in the Deaneries of Elham and Lympne, whose Names are thereunto subscribed; taking notice of a Bill depending in this House, intituled, "An Act to amend an Act passed in the First Year of His present Majesty's Reign, intituled, "An Act to permit the general Sale of Beer and Cyder by Retail in England;" and praying their Lordships "to introduce into the same a Clause to prohibit Houses known by the Name of "Beer Shops" from being opened for the Sale of Beer on the Lord's Day, or that at least on such Day no Beer should be sold in any such Shops to be consumed upon the Premises; and that all Beer Shops should be compelled by Law to be closed every Day in the Week at an Hour not later than Six o'Clock from the Eleventh of October to the Eleventh of April, and than Eight from the Eleventh of April to the Eleventh of October:"
Upon reading the Petition of the Minister, Churchwardens, Occupiers and principal Inhabitants of the Parish of Speen, in the County of Berks, whose Names are thereunto subscribed; praying, "That their Lordships will take into their Consideration the Propriety of repealing or materially altering the Act for permitting the general Sale of Beer by Retail in England:"
It was moved, "That the Bill, intituled, "An Act to amend the Laws in England relative to Game," be now read a Second Time. Hodie 3a vice lecta est Billa, intituled, "An Act for effectuating a Partition of Estates belonging to The Most Honorable John Crichton Stuart Marquess of Bute and Earl of Dumfries and The Most Honorable Maria Marchioness of Bute and Countess of Dumfries, and their Trustees, and to The Right Honorable Lady Susan North, and to The Right Honorable Lady Georgina North; and for other Purposes." 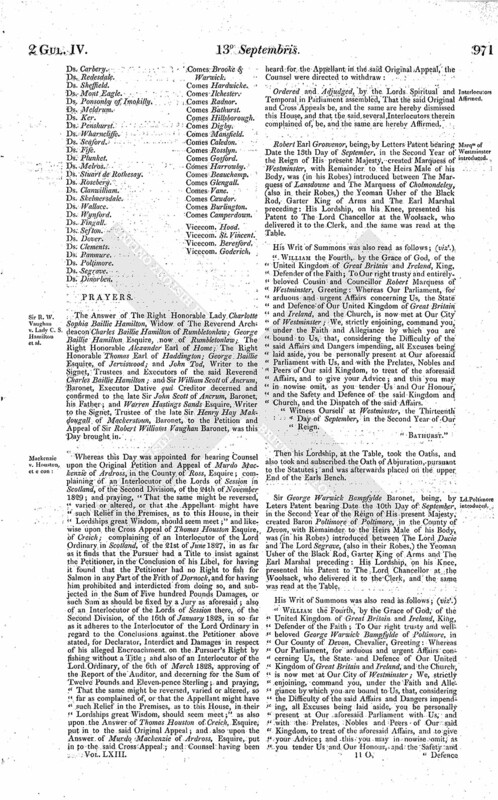 And also, Upon reading the Petition of the Inhabitants of the Parish of Wilton, in the North Riding of the County of York, whose Names are thereunto subscribed; severally praying their Lordships "to take prompt and immediate Measures for the early and utter Extinction of Slavery in the British Colonies:"
Upon reading the Petition of the Inhabitants of the Parish of Winscombe, in the County of Somerset, whose Names are thereunto subscribed; praying their Lordships "to take into Consideration the Propriety of adopting Measures for the immediate and total Extinction of Slavery in the British Colonies, a System so repugnant to the Spirit of the British Constitution, and to the clearest Dictates of Justice, sound Policy, Reason and Religion:"
Upon reading the Petition of the Inhabitants of Shepton Mallet and its Vicinity, in the County of Somerset, whose Names are thereunto subscribed; praying their Lordships "to devise and enforce some decisive Measure whereby all Children which may hereafter be born of Slaves shall be declared free, and Provision made for the entire Abolition of Slavery at an early Period, with such Regard to the Indemnity of the Planters as to their Lordships shall seem fit; and with such Legislative Provisions and Restraints as shall place the liberated Negroes under the Authority and Protection of just and equal Laws:"
Upon reading the Petition of the Inhabitants of Stoney Stanton, in the County of Leicester, whose Names are thereunto subscribed; praying their Lordships, "That so foul a Stain as Slavery may speedily be blotted out from our Land by the Termination of so iniquitous and revolting a System; and that no British Subject may henceforward be or bear the Title of a Slave:"
Upon reading the Petition of the Inhabitants of Norton Saint Philip, in the County of Somerset, and its Vicinity, whose Names are thereunto subscribed; praying their Lordships "forthwith to adopt such Measures as may secure the complete Abolition of Slavery throughout the British Dominions, at the earliest possible Period consistently with the established Interests of Individuals and Property in our Colonies:"
Upon reading the Petition of the Commons of the Province of Lower Canada, in Provincial Parliament assembled, signed by their Speaker; praying their Lordships "to take their Case into favorable Consideration, and adopt such Measures as may lead to the Exercise of the Royal Prerogative for Remedy of the Evils of which they complain, to the End that they may be wholly and for ever removed; and particularly to the following; (viz.) 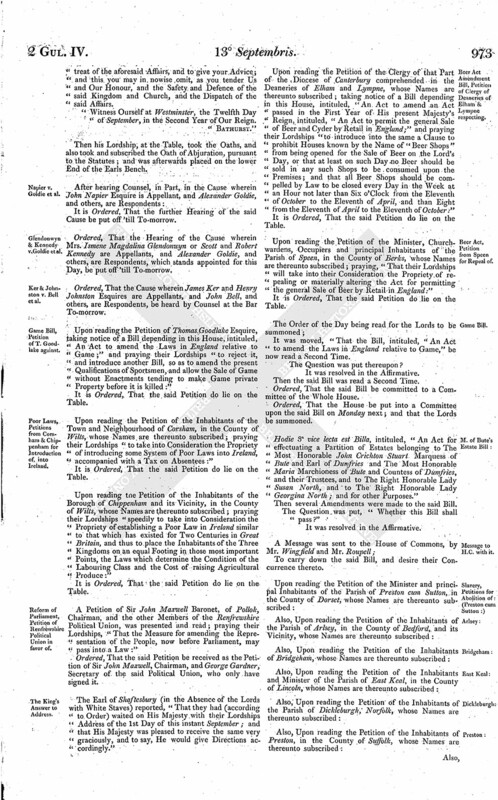 The Interspersion of Crown and Clergy Reserves among the Lands granted by the Crown; the Evils resulting from Imperial Legislation for the internal Concerns of the Colony; the Composition of the Legislative Council; the Dependence of the Judges, and their Interference with the Political Business of the Province; the Want of Responsibility and Accountability of Public Officers, and of a Tribunal in the Colony for the Trial of Impeachments; the withholding of the Revenues of the Estates of the late Order of Jesuits from the Purposes of Education; and the Management of the Waste Lands of the Crown, in consequence of which Applicants for actual Occupation are prevented from freely possessing the same under secure Titles, in sufficient Quantities for Cultivation, without unnecessary Delay, and without any Expence or Burthen, other than the fair and necessary Costs of Survey and Title:"
Upon reading the Petition of the Roman Catholic Clergy and Laity of the Parish of Newmarket; County of Cork, Ireland, whose Names are thereunto subscribed; praying, "That their Lordships may place at the Disposal of the Roman Catholic Bishops and Clergy of Ireland a Portion of the Money usually granted for the Education of the Poor of Ireland:"
Upon reading the Petition of the Roman Catholics of the Parish of Churchtown, in the Diocese of Cloyne and County of Cork, whose Names are thereunto subscribed; praying their Lordships "to take into their serious Consideration the Situation of the Youth of Ireland professing the Roman Catholic Religion, with a view to grant a Portion of the Public Money to be placed at the Disposal of their Clergy for their Education; whose Talents, Knowledge and Experience eminently qualify them for that Purpose:"
Upon reading the Petition of the Roman Catholic Inhabitants of the United Parishes of Ballynakill and Kilcroan, in the County of Galway, Ireland, whose Names are thereunto subscribed; praying their Lordships "to order such a Distribution of the Funds usually granted to the Kildare Street Society, for the Education of the Poor of Ireland, as will entitle His Majesty's Roman Catholic Subjects to a free and impartial Education:"
Upon reading the Petition of the Roman Catholic Inhabitants of St. Mary's, Athlone, County of Westmeath, Ireland, whose Names are thereunto subscribed; praying their Lordships, "That a fair and equitable Proportion of the usual Grant of Twenty-five thousand Pounds for the Education of the Poor of Ireland be given to the Roman Catholic Bishops and Priesthood of Ireland, who have ever proved themselves to be ardent and zealous Supporters of a liberal, enlightened and religious System of Education:"
Upon reading the Petition of the Inhabitants of the Parish of Whitechurch, in the County of Cork, whose Names are thereunto subscribed; praying their Lordships to enact a Law by which a yearly Sum may be granted the Petitioners for the Education of their Children, exclusive of that afforded by the Kildare Street Society, which very often causes Hostility between the Landlord and his Tenant, between the Employer and his poor Labourer, and in some instances between the Parent and his Children:"
Upon reading the Petition of the Inhabitants of the United Parishes of Johnstown and Walterstown, County of Meath, whose Names are thereunto subscribed; praying, "That their Lordships will apportion an equitable Share of the Grant for the Education of the Poor of Ireland to be exclusively subject to the Inspection of the Roman Catholic Clergy of Ireland, for the Education of the Children of their Communion:"
Upon reading the Petition of the Roman Catholic Inhabitants of the Parish of Ratoath, in the County of Meath, whose Names are thereunto subscribed; praying their Lordships "to transfer a Part at least of the Grant to the Kildare Place Society, for the Education of the Poor of Ireland, to the Roman Catholic Laity and Clergy, to be by them expended on a System of Education agreeable to the Feelings and compatible with the Religious Principles of a large Majority of the Irish People:"
Upon reading the Petition of the Roman Catholic Inhabitants of the United Parish of Kilbolane, in the County of Cork, whose Names are thereunto subscribed; praying their Lordships "to withhold from the Kildare Street Society its Annual Grant for the Education of the Poor of Ireland, and place it in the Hands of the Roman Catholic Bishops, who, it will be seen, will give general Satisfaction to every Denomination of Christians:"
Upon reading the Petition of the Roman Catholic Inhabitants of the United Parish of Ballyclough and Kilbrin, in the County of Cork, Ireland, whose Names are thereunto subscribed; praying their Lordships "to withhold from the Kildare Street Society all and every Grant of Money for the Education of the Poor of Ireland, and to vote the same to the Bishops and Pastors of the Roman Catholic Church in Ireland, who will be responsible to their Lordships for the Sums which may be respectively granted them for the Instruction of the People:"
Upon reading the Petition of the Parishioners of Liscarroll, in the County of Cork, whose Names are thereunto subscribed; praying their Lordships, "That the Distribution of the Grant to the Kildare Street Society, for the Education of the Poor of Ireland, be transmitted to an equal Number of the Petitioners Catholic Brethren, as well as to Protestants, and that their Catholic Prelates and Irish Hierarchy may have a Control over the Expenditure of a Part of said Grant which it is prayed may be allocated to Petitioners:"
Upon reading the Petition of the Roman Catholic Inhabitants of the Town of New Ross and its Vicinity, whose Names are thereunto subscribed; praying their Lordships "to give a Portion of those Funds hitherto granted to the Kildare Street Society, for the Education of the Poor of Ireland, to the Roman Catholic Bishops, under whose Superintendence the Catholic People of Ireland will most willingly and thankfully receive the great Boon of Education:"
Upon reading the Petition of the Inhabitants of the Parish of Cloundrohid, in the County of Cork, whose Names are thereunto subscribed; praying their Lordships, "That, by the proper Distribution of the Grants for the Education of the Poor of Ireland, the Petitioners Children may be educated according to the Religion adopted and professed by their Parents:"
Upon reading the Petition of the Inhabitants of the Parish of Kilnamartra, in the Barony of West Muskery and County of Cork, whose Names are thereunto subscribed; praying their Lordships "to take the State of Education in Ireland into immediate and serious Consideration, and to direct that the Funds now entrusted to the Kildare Street Society may be so distributed as to be conducive to the Improvement and consonant with the Religious Feelings of the great Body of the People:"
Upon reading the Petition of the Governors and Trustees of upwards of Thirty Roman Catholic Orphan Societies in the City of Dublin, whose Names are thereunto subscribed; praying their Lordships "to divide the Sums intended for Public Education, proportionably to the Wants and Number of the Poor of each Communion in Ireland, amongst the Guardians of each respectively, who will thus be enabled to educate the ignorant agreeably to their Conscience and Religion, and consistent with the Dictates of Civil and Religious Liberty:"
Upon reading the Petition of the Inhabitants of Newtownbarry and Kilmashal, Parish of St. Mary's, County Wexford, whose Names are thereunto subscribed; praying their Lordships "to disarm the Yeomanry Corps of Ireland, and to institute such legal Proceedings with regard to the late melancholy Affair at Newtownbarry as may bring to condign and immediate Punishment the Offenders of the Law, and rescue the Course of Justice from being obstructed by a bigoted Faction:"
Upon reading the Petition of the Roman Catholic Inhabitants of the Parish of Navan, in the County of Meath, whose Names are thereunto subscribed; praying their Lordships "to direct that the Yeomanry Force of Ireland be immediately disbanded; and that, if found necessary, the King's regular Troops be employed in their Stead:"
Upon reading the Petition of the Inhabitants of Leighlin Bridge, County of Carlow, Ireland, whose Names are thereunto subscribed; praying "That their Lordships will be pleased to adopt immediate Measures for disarming the present Yeomanry of Ireland, as the Petitioners are seriously of Opinion that it will otherwise no longer be in the Power of the Friends of Peace to maintain that Influence which has hitherto been exerted with Effect to control the Feelings of the People, and preserve the Country from a dreadful Convulsion:"
Upon reading the Petition of the Inhabitants of New Ross, in the County of Wexford, Ireland, whose Names are thereunto subscribed; praying their Lordships "to cause to be disarmed the Yeomanry Corps of this County, thereby ensuring to the Petitioners a Return to that peaceable and orderly State which they have ('till now) uninterruptedly enjoyed for a long Series of Years:"
Upon reading the Petition of the Inhabitants of the Parishes of Lady's Island, Caron and St. Margaret's, in the County Wexford, whose Names are thereunto subscribed; praying their Lordships "to disband the present Yeomanry Force of Ireland; and if the Presence of an armed Force be deemed necessary by His Majesty's Government, that His Majesty's brave and disciplined Troops may be employed in place of an undisciplined Yeomanry Force, which, if continued, will tend more to disturb than to preserve the Public Tranquillity:"
And also, Upon reading the Petition of the Inhabitants of the County of Wexford, whose Names are thereunto subscribed; severally praying their Lordships, "to disband the present Yeomanry Force of Ireland, it being now manifest that their Continuance will tend more to the Disturbance than the Preservation of the Public Tranquillity; and, if the Presence of an armed Force be deemed necessary by His Majesty's Government, that His Majesty's brave and disciplined Troops may be employed, as in such Case only can the Petitioners hope to preserve the future Tranquillity of their County:"
And also, Upon reading the Petition of the Inhabitants of the United Parishes of Baldoyle, Howth, Kilbarrack, St. Dologh, Kinsealy and Portmarnock, situated in the County of Dublin, whose Names are thereunto subscribed; severally praying their Lordships "to repeal the Legislative Union between Great Britain and Ireland:"
Upon reading the Petition of the Irish Medical and Surgical Students resident in Dublin in 1831, whose Names are thereunto subscribed; praying their Lordships, by repealing the Legislative Union between Great Britain and Ireland, to add to the Throne of England a powerful, an affectionate and a grateful Nation, in the Place of a miserable and a discontented Province:"
Upon reading the Petition of the Inhabitants of the Parish of Raheen, Queen's County, Ireland, whose Names are thereunto subscribed; praying their Lordships "to repeal the Act of Union between Great Britain and Ireland, and thereby restore to the Petitioners their Domestic Legislature:"
Upon reading the Petition of the Nailers of the City of Dublin, whose Names are thereunto subscribed; praying, "That their Lordships will take into Consideration the Act of Legislative Union between Great Britain and Ireland, with a view to its immediate Repeal; and that His Gracious Majesty may be advised to consult the most vital Interests of His devotedly-attached Irish Subjects, by His Concurrence in restoring to them their Parliament, reinstating them in their indubitable and unjustly-withdrawn Rights of being legislated for by their own Houses of Lords and Commons, permitting them to share, in common with their British Fellow Subjects, the Benefits of our admirable Constitution, thereby securing the Petitioners Gratitude, and confirming their Attachment:"
Upon reading the Petition of the Inhabitants of Whitechurch, in the County of the City of Cork, whose Names are thereunto subscribed; praying their Lordships "to adopt some Measure by which Employment will be given to starved oppressed Men who are willing and able to work, and a Support to the aged and infirm, who cry to this House for Redress, by establishing a System of Poor Laws, and by moderately assessing the Church, together with the Properties of Absentees:"
Upon reading the Petition of the Mortality Society of Galway, whose Names are thereunto subscribed; praying, "That their Lordships will be graciously pleased to equalize Civil Rights in Galway, by extending to the Roman Catholic Mercantile and Trading Classes the Elective Franchise in as full and ample a Manner as the same is now enjoyed by Protestants:"
Upon reading the Petition of the Inhabitants of the United Parishes of Maglass, Ballymore, Killinick and Shannon, in the Barony of Forth and County of Wexford, whose Names are thereunto subscribed; praying their Lordships, "That the Measure for amending the Representation of the People in England may pass into a Law; and that the Privileges contemplated in that Measure may be extended to Ireland:"
Upon reading the Petition of the Inhabitants of the Parish of Navan, in the County of Meath, whose Names are thereunto subscribed; praying their Lordships, "That Members for Parliament be elected by Ballot:"
Upon reading the Petition of the Roman Catholic Inhabitants of the Parish of Ratoath, in the County of Meath, whose Names are thereunto subscribed; praying their Lordships "for the immediate Repeal of the Burial Act, Ireland, a Law calculated to perpetuate the Memory of Civil and Religious Pains and Disabilities by which the Roman Catholics of Ireland were aggrieved during a long Series of Years,-a Law which, by requiring the Roman Catholic Clergy to submit to an intolerable Indignity, deprives both the dead and the living of those Benefits and Consolations on which the Religious Faith of Roman Catholics teaches them to place a high and sacred Value:"
Upon reading the Petition of the Roman Catholic Clergymen of Navan, in the County of Meath, whose Names are thereunto subscribed; praying their Lordships, "That the Penal Law, which imposes a Penalty of heavy Fine and long Imprisonment on a Roman Catholic Clergyman for marrying a Person of the Established Church to one of his own Communion, be abrogated:"
Upon reading the Petition of the Inhabitants of the Parish of Navan, in the County of Meath, whose Names are thereunto subscribed; praying their Lordships, "That those demoralizing Laws, by which a Marriage between a Protestant and a Catholic is void if celebrated by a Catholic Clergyman, be repealed, so that such Marriages shall be valid and lawful:"
Upon reading the Petition of the Roman Catholic Inhabitants of the Parish of Navan, in the County of Meath, whose Names are thereunto subscribed; praying their Lordships, "That the Church Lands may be resumed, in order to apply them to the general Good of the People of Ireland:"
Ordered, That all the Lords be summoned to attend the Service of the House on Tuesday next. Ordered, That the said Report be taken into further Consideration on Thursday next; and that the Lords be summoned. 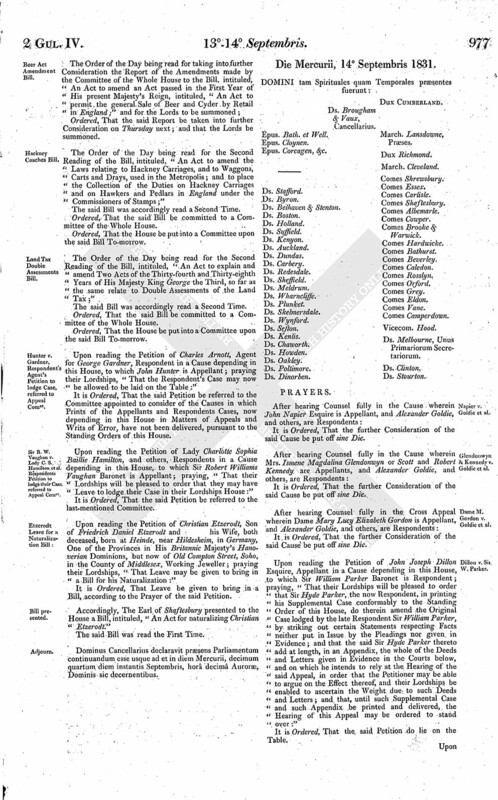 The Order of the Day being read for the Second Reading of the Bill, intituled, "An Act to amend the Laws relating to Hackney Carriages, and to Waggons, Carts and Drays, used in the Metropolis; and to place the Collection of the Duties on Hackney Carriages and on Hawkers and Pedlars in England under the Commissioners of Stamps;"
The Order of the Day being read for the Second Reading of the Bill, intituled, "An Act to explain and amend Two Acts of the Thirty-fourth and Thirty-eighth Years of His Majesty King George the Third, so far as the same relate to Double Assessments of the Land Tax;"
Upon reading the Petition of Charles Arnott, Agent for George Gardner, Respondent in a Cause depending in this House, to which John Hunter is Appellant; praying their Lordships, "That the Respondent's Case may now be allowed to be laid on the Table:"
Upon reading the Petition of Lady Charlotte Sophia Baillie Hamilton, and others, Respondents in a Cause depending in this House, to which Sir Robert Williams Vaughan Baronet is Appellant; praying, "That their Lordships will be pleased to order that they may have Leave to lodge their Case in their Lordships House:"
It is Ordered, That the said Petition be referred to the last-mentioned Committee. Upon reading the Petition of Christian Etzerodt, Son of Friedrich Daniel Etzerodt and his Wife, both deceased, born at Heinde, near Hildesheim, in Germany, One of the Provinces in His Britannic Majesty's Hanoverian Dominions, but now of Old Compton Street, Soho, in the County of Middlesex, Working Jeweller; praying their Lordships, "That Leave may be given to bring in a Bill for his Naturalization:"
Accordingly, The Earl of Shaftesbury presented to the House a Bill, intituled, "An Act for naturalizing Christian Etzerodt." Dominus Cancellarius declaravit præsens Parliamentum continuandum esse usque ad et in diem Mercurii, decimum quartum diem instantis Septembris, horâ decimâ Auroræ, Dominis sic decernentibus.